Craving Italian food with a Mediterranean twist? Instead of using marinara sauce, which could potentially be really messy and runny in the oven, opt for using hummus instead. 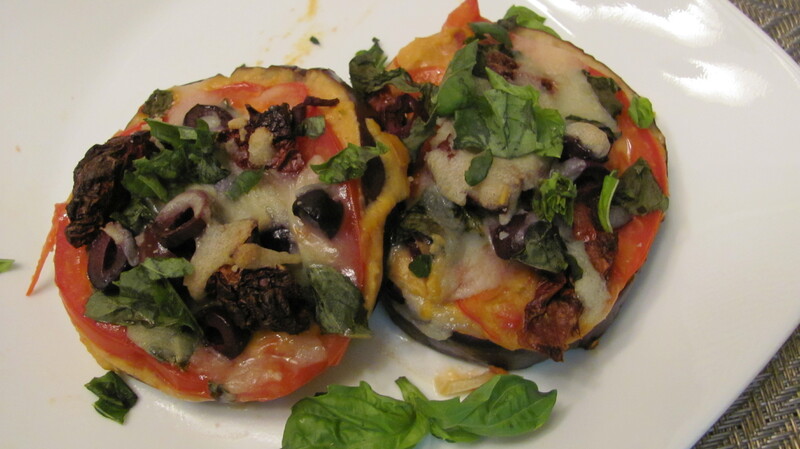 These mini eggplant stack pizzas are bursting full of the rich flavor of sun-dried tomato and Italian herbs. Serve with a drizzle of olive oil and fresh chopped basil. Preheat oven to 400°. Cut eggplant into 1/2 slices. Discard the bottom piece and the top piece with the stem. Lightly sprinkle each slice with salt and arrange on cookie sheet. 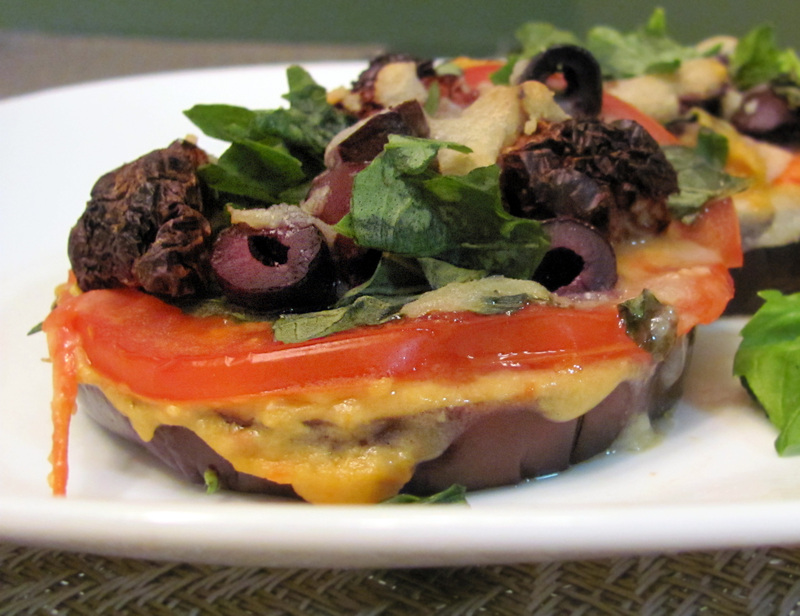 Add approximately 1 tablespoon of hummus to each eggplant slice. Sprinkle with Italian seasoning to your liking. Slice tomato very thin and stack that on top of the hummus layer. Now, add a few kalamata olives, pieces of sun-dried tomato, fresh basil and top each with 1-2 tablespoons of the mozzarella shreds. Bake for 20 minutes on the rack one notch down from the very top in the oven. Eggplant peel should be deep purple, almost black and the light-colored fleshly part should turn into a creamy consistency. Serve with a drizzle of full flavor olive oil, or salad oil with Italian spices. Serves 3-4.